The Guitar Column: NAMM 2010 Suhr Modern with Scalloped Fingerboard on eBay! NAMM 2010 Suhr Modern with Scalloped Fingerboard on eBay! 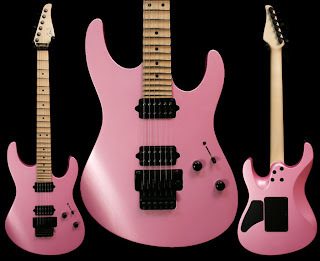 The metallic pearl pink paint job, Gotoh Floyd Rose, pointy headstock and those dual humbuckers would go perfectly with striped spandex pants and high-cut tennis shoes. Don't we all long for the good ol' days when MTV videos looked like they were shot by film school dropouts and bands actually managed to sell warehouse loads of records? I found it interesting that Suhr chose to go with a basswood body for this axe -- Ibanez's shred guitars have always featured basswood bodies almost exclusively. Basswood is a softer wood that helps to temper the shrill metallic, top-end frequencies of Floyd Rose bridges. The addition of a maple top on this Suhr Modern tightens up the top-end a little and also provides a more stable anchor for the Gotoh Floyd's bridge stud mounts. And what about that maple 24-fret scalloped fretboard with a compound radius no less? Dare I say -- pure CNC and Plek perfection! Jumbo stainless steel frets, Sperzel locking tuners (kind of redundant in this case, except that they don't need any winding around the string posts), 5-way switch, single volume and tone, and Suhr Doug Aldrich signature humbuckers make this piece of guitar eye-candy a functioning instrument. The icing and the cherry on this cake is the Suhr logo inlaid in abalone and the laser-etched wood Certificate of Authenticity. The Suhr guitars booth at this year's NAMM show surely wins my vote for most imaginative variations on a single theme.